OMG! 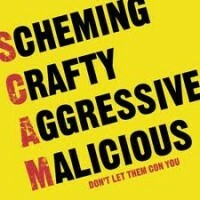 You will love this website “Ponzi Scam Tracker”!!! Sorry, no Hack Guru ‘bashing’ for today. However, a good friend of Mr. IQD sent me this REALLY AWESOME website that tracks current Ponzi Schemes & SCAMS and even will publish court docs and filings. It is really amazing to see how some of these con artists develop schemes to steal $Millions of dollars from friends, family, co-workers and other unsuspecting victims! MY FAV. QUOTE: After gaining the trust of family and friends, she began pitching investments that she represented were reserved only for corporate and high-level clients due to their lucrative annual returns ranging from 10% to 15%. Also, “NO” I don’t get paid for sending you over there – they currently know nothing of my http://www.MrIQD.com website. Hope you learn and enjoy from their website. This entry was posted in ADVICE, How To Avoid Investing Scams, Okie Oil Man, Other Hack Pumpers, Post RV Survival Tips, Tony TNT and tagged con artist, FRAUD, help, Ponzi Schemes, prevention, scam by MrIQD.com. Bookmark the permalink.